Pediatric Heel Pain or Sever's Disease, also known as calcaneal apophysitis, is a disease of the growth plate of the bone and is characterized by pain in the heel of a child's foot, typically brought on by overuse of the bone and tendons in the heel. This can come from playing sports or anything that involves a lot of heel movement. It can be associated with starting a new sport, or the start of a new season. Children who are going through adolescence are also at risk of getting it because the heel bone grows quicker than the leg. Too much weight bearing on the heel can also cause it, as can excessive traction since the bones and tendons are still developing. It occurs more commonly in children who over-pronate, and involves both heels in more than half of patients. This condition is most common in children ages 10 to 15 and is frequently seen in active soccer, football, or baseball players. Sport shoes with cleats are also known to aggravate the condition. The disease mimics Achilles tendonitis, an inflammation of the tendon attached to the back of the heel. A tight Achilles tendon contributes to Sever's Disease by pulling excessively on the growth plate of the heel bone (calcaneus). What are the Symptoms of Pediatric Heel Pain, or Sever's Disease? 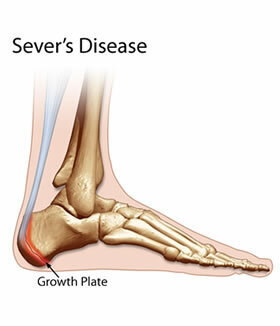 The most prominent symptom of Sever's disease is heel pain which is usually aggravated by physical activity such as walking, running or jumping. The pain is localised to the posterior and plantar side of the heel over the calcaneal apophysis. Sometimes, the pain may be so severe that it may cause limping and interfere with physical performance in sports. External appearance of the heel is almost always normal, and signs of local disease such as edema, erythema (redness) are absent. The main diagnostic tool is pain on medial- lateral compression of the calcaneus in the area of growth plate, the so called squeeze test. Foot radiographs are usually normal, but are necessary to rule out other pathology. Therefore the diagnosis of Sever's disease is primarily clinical. Once a diagnosis of Sever's Disease is given, treatment options can be discussed. Treatment may include cutting back on sports activities, specific stretching exercises, shoe modifications, icing, and/or anti-inflammatory medications.